Treating the soap batter as if it were the cake batter in the video, I basically followed the instructions given in the video; except I did straight lines instead of curved, because I was using a straight loaf mold. I separated my soap base into 3 portions; smaller pink and brown portions (both colored with micas), and a larger uncolored portion. One thing I should mention too, is that you would want to try to stagger your leopard spots throughout the soap by layering your stripes in different heights throughout your soap. 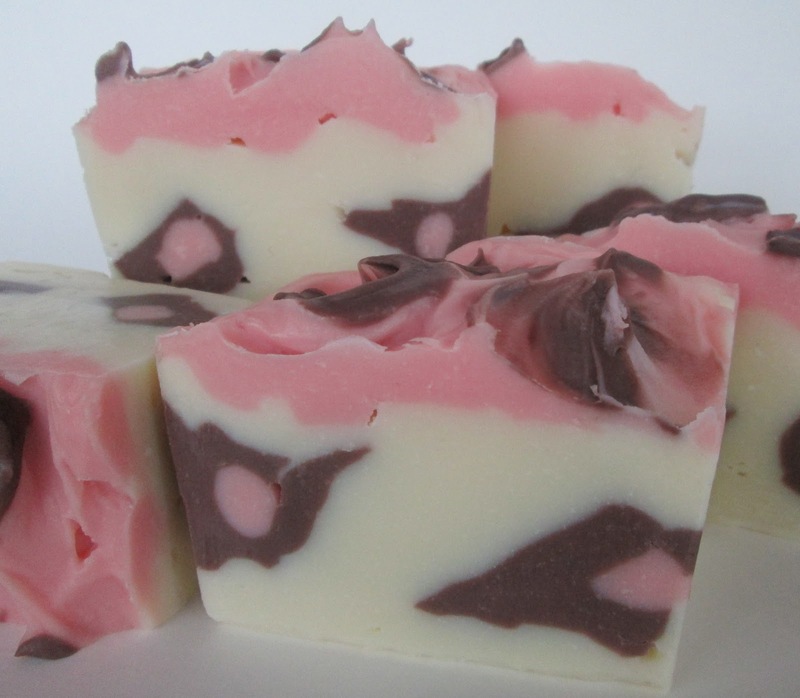 In the video, they show just doing one layer of stripes, but I would try to do stripes at different layers of soap, so that the spots are staggered at different levels throughout your cut soap. 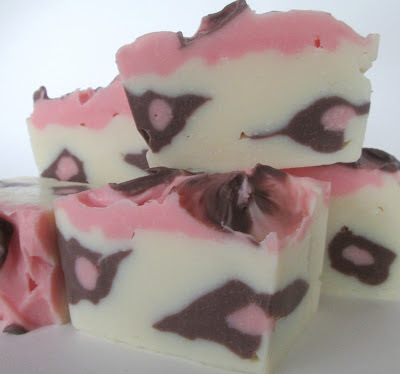 Next time, I would also cut smaller tips in my piping bags, so that I could fit more leopard spots into the soap. Anyway, I think it’s a cute technique and has potential....you could do so many fun color combinations with this! Happy soaping everyone! that is a great pipping idea! Thanks Emily, it's a pretty simple but effective technique! 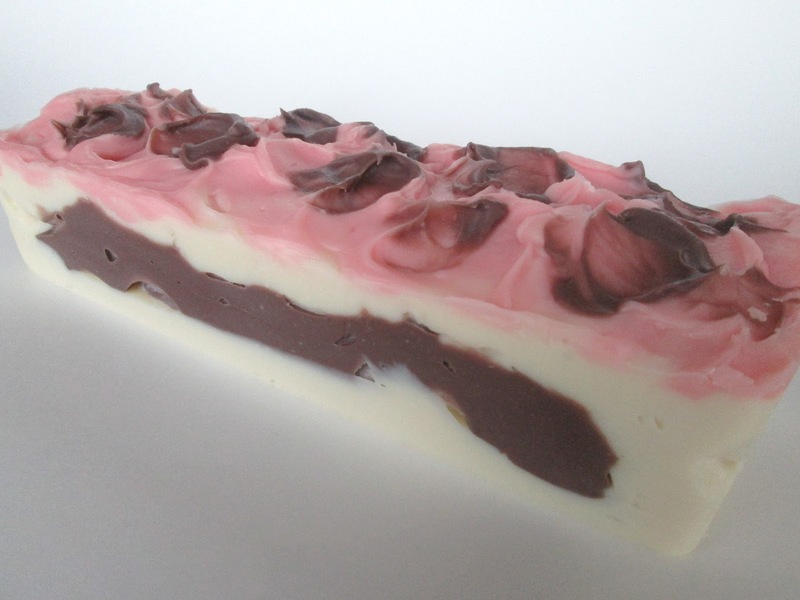 Oh Cee Gee, this is such a gorgeous soap, love it. So whimsical and cute, lots of potential color ideas running through my mind right now! Thanks for the link to the cake decorating, that helped me understand what you meant. Great correlation between cake decorating and soap creating that you made. 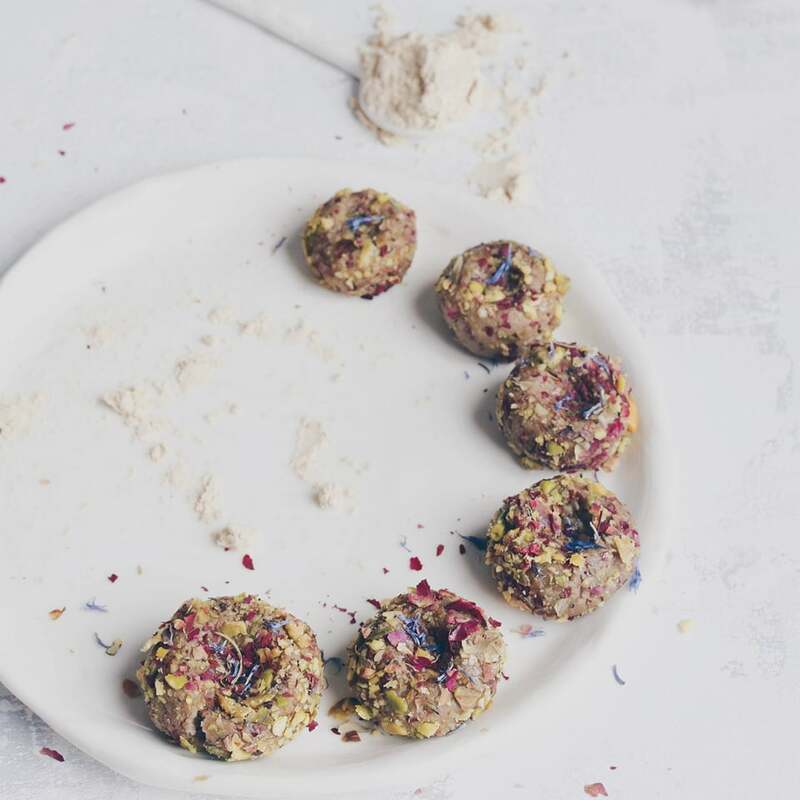 Lots of inspiration on your blog! Thanks so much Anna...you could really have a lot of fun with some wild color combinations! I'm so happy you are finding inspiration here, if you get a chance to try this technique, I'd love to see some pictures! This is really beautiful. I like that you chose pink, such unique and fancy leopard! Fabulous look! You got a stunning soap!!! I love it,so inspirational! Looks like some baby's stuffed leopard! Or,like a strawberry-chocolate cake! So lovely,Cee! Very cool, Cee Gee! 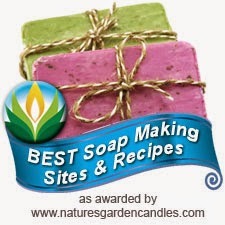 I like to bake, too, and it is interesting how baking and soapmaking share similarities. It is very clever how you took a baking technique and translated it into soap. The leopard spots look great. Thanks for sharing! Totally awesome design! I love the pink and brown together! Wow! That is a fun soap. I would have never guessed that you made multicolored spots. wow, very inspirational, Cee Gee! Excellent idea! I just did my first piping project (cupcake soaps) and found it to be so much fun. I think I am going to start playing around with piping my soap a lot more! Thanks so much Anne-Marie, I was lucky it worked on the first try...lol! 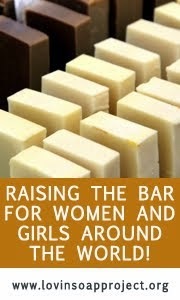 Cee, I keep peeking at your soap in your blog and FB page! I just love it! It's beautiful! Thanks so much Lindy, I was thrilled Amy included it in her challenge and I can't wait to see everyone's interpretations! Thanks Jennifer, I can't wait to see yours! I have to admit, I'm a little nervous wondering if I can pull it off a second time...lol! Omg I normally don't do cp soap or fu fu type soaps, but I was bored today and tried it. Lol. It came out perfect! I love it, I may incorporate the spots in regular cp bars from now on :)) thank you!